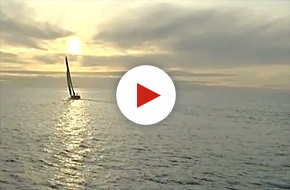 Our featured video documentary Racing Around the World Alone is about the Vendée Globe Ocean Race. It will be premiering on the Documentary Channel January 31st, 2011 at 9pm ET /10pm PT. This project fits within the mandate of Wind Athletes Canada as a way to promote the sport of sailing to the Canadian public. This has been most successful in France where the Vendée Globe is the equivalent to the Stanley Cup Play-offs in Canada, only it actually holds the attention of a Nation for 3 months as these brave and crazy adventurers make their way around the world on a 60 foot boat entirely alone and without stopping for anything except irreparable equipment or an untimely demise. 27,000 miles around the world, non-stop, and alone on a 60-foot sailboat, the Vendée Globe race is one of the most extreme challenges a human being can face. The Vendée Globe Ocean Race was founded by French sailor Philippe Jeantot in 1989 and since 1992 has taken place every four years. The Vendée Globe is quite simply the pinnacle event in solo Ocean racing. Dubbed the “Everest of the Oceans” by Jeantot when he first described it. Although well acquainted with the rigors of solo ocean racing and harshness of the sea, he wanted more, and so he came up with the idea for a round-the-world, single-handed, unassisted, non-stop yacht race which he called “Vendée Globe,” starting and finishing in Les Sables d’Olonne, France, for 60-foot monohulls. Conceptually the Vendée Globe was actually born much earlier than 1988. Thirty years earlier, sailors everywhere and particularly single-handed sailors had been inspired by Francis Chichester’s famous voyage in his boat, Gypsy Moth IV. He was the first to sail around the world alone stopping only once in Australia. He was knighted shortly after his return and became Sir Francis Chichester. After this celebrated feat, sea faring adventurers everywhere now had reason to believe that now it could be done with no stops. This fascination gave birth to the Golden Globe – a solo non-stop circumnavigation of the world. The start of the race was to take place during a window of time between June 1st and October 31, 1968. Competitors had to start and return to England to finish. Sponsored by the British Sunday Times newspaper, there were two prizes – one for fastest time and one for the first skipper home. In 1968, nine sailors set out to sea to claim the prizes and only one man completed the race – Sir Robin Knox-Johnston who now over 70 years of age still competes in solo ocean races. The Vendée Globe Ocean Race happens every 4 years. The next edition will start in November 2012. If you are interested in becoming a sponsor of this project please contact us for more information. Visit the Racing Around the World Alone website to learn more about the documentary. The 21st edition of the Canada’s Cup was held in 2007 at the Royal Canadian Yacht Club in Toronto. This video chronicles some of the history of the Cup which dates back to 1896. 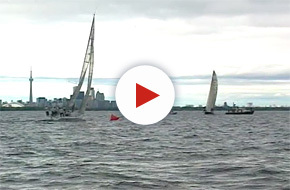 There are interviews with sailors who have competed for the Cup over the years, lots of coverage of the training leading up to the 9 race series and some terrific footage of the actual racing with expert commentary that will keep viewers on the edge of their seats. The Canada’s Cup is a trophy rich with tradition. The Cup is a match race competition between one American team and one Canadian team. The 2007 Edition was sailed in Farr 40’s. In 2007 Alek Krstajic of the RCYC skippered his boat Honour to an extremely narrow defeat against Robert Hughs’ team of professional sailors. This 45 minute documentary shows the preparation of the Canadian team, which was largely made up of young sailors with very little time in the boat together. It is a remarkable story about team work and a tribute to the skills and abilities of Alek’s team. 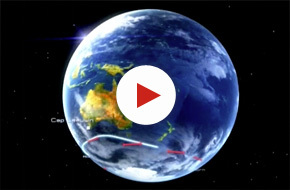 Racing Around the World Alone is the story of the 2008/2009 Vendée Globe race. 30 skippers embark on a quest to be the fastest to sail 27,000 miles around the world, non stop, without assistance and alone on 60 foot sailboats. This is one of the most extreme challenges a human being can face. 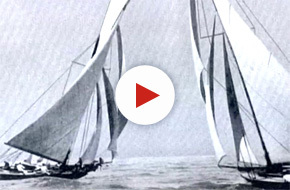 Watch the 2008 Vendee and other documentary films about Racing Open 60s.